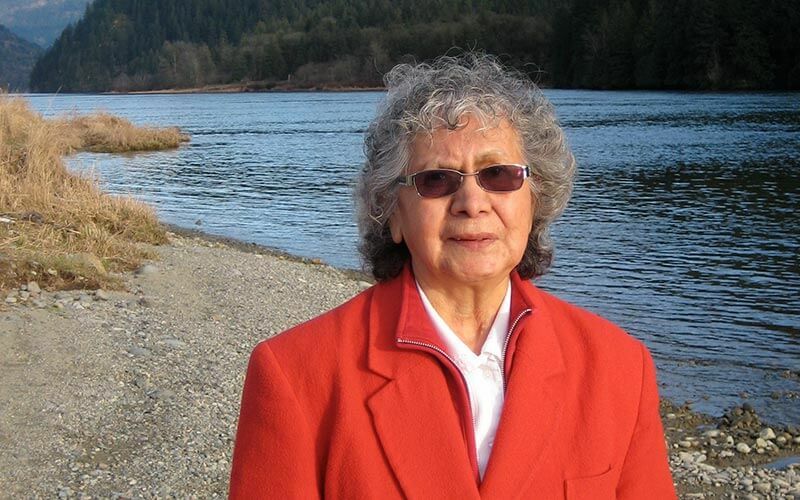 (YALE) Rose Charlie has had many titles over the years: President (of the Indian Homemakers Association of B.C), Doctor of Laws (an honorary degree from UBC in 1989) and Grand Chief (of the B.C. Union of Indian Chiefs) just to name a few. Now she’s being honoured for one of her lesser-known — but important — roles: Keeper of the Peace Piano. The distinguished member of the Chehalis Indian Band will be the guest of honour at a reception and tea at the Yale Historic Site on April 18. The event will recognize the role Rose and the Charlie family played in preserving the 1853 Trevor-Marshall “peace piano,” which is now in the Yale Museum. “It’s an honour for us to recognize the crucial role Rose and the Charlie family played in preserving this very important heritage treasure,” said Yale and District Historical Society (YDHS) Acting President Sharon Blythe. The vintage square grand Victorian piano was originally located in China Bar just below Boston Bar. It belonged to Sofie Johnson, an ancestor of Lieutenant Governor Stephen Point. It’s said to have saved lives during the Fraser River gold rush and Canyon War by providing a musical bridge between First Nations and the thousands of gold seekers who flooded into the Fraser Canyon in 1858. The piano came to Scowlitz before 1920 and to Chehalis after 1950. Still in playing condition, it does require some repairs and restoration, but it will be on display during the Rose Charlie 1853 Piano Reception and Tea from 1-3 p.m. The April 18 event will also help Yale kick off B.C. Arts Culture Week. The much-travelled musical instrument was presented to the Yale and District Historical Society by the Hope Region Spirit of B.C. Committee in January as part of the Hope Region Spirit of B.C. Heritage Assembly festivities. Funding assistance was provided through the New Pathways to Gold Society (NPTGS) as part of the Society’s “Time to Share Again” heritage tourism initiative. NPTGS received funding from Western Economic Diversification Canada last spring to help identify heritage tourism opportunities along the Gold Rush trails including assisting organizations in establishing sustainable annual events. The New Pathways to Gold Society is a community-based organization dedicated to economic development through investment in B.C. heritage and continued reconciliation with First Nations. The Society is working in partnership with the Aboriginal Tourism Association of B.C. (ATABC) on the “Time to Share Again” initiative. The funding for “Time to Share Again” was provided under the Community Economic Diversification Initiative (CEDI). The program supports a wide range of projects that further economic growth, job creation and future community sustainability. Western Economic Diversification Canada works with the provinces, industry associations, and communities to promote the development and diversification of the western economy, coordinates federal economic activities in the West and represents the interests of western Canadians in national decision making.